Dalton experienced homelessness for four years, but now has a home at one of our permanent supportive housing communities. Dalton has always been passionate about cooking, and now that he has a home he not only makes masterful dishes for himself, but shares his culinary talents with all his neighbors! Welcome home, Dalton! Brandi never thought she’d find herself with two daughters and no home. After working diligently with her case managers, she finally found a safe place for her and her daughters to live, grow, and create memories in together. A red 1986 rusted truck is what brothers, Dennis and Mike called “home” for over five years. Things looked up when they were able to rent an RV. However, the “bug infested box” as they call it, cost them $450 a month. No working toilet. No shower. No running water. That was “home” for another restless six years. Mike, working since he was seventeen, did not make enough to afford a decent apartment for both him and his brother. Nancy used to sleep in her car. When she lost that to an accident, she slept behind a dumpster on pieces of cardboard. 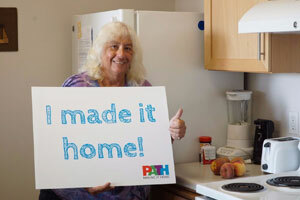 After two years of experiencing homelessness, community members rallied to support Nancy and connected her to PATH Ventures. Now she has her own apartment, and was reunited with her cat, Ash. Jonathan proudly served in the Navy from 1985-1987. After his service, he spent many years working in the entertainment industry in Los Angeles. However, his stable life became tumultuous when his roommates stopped paying rent. He struggled financially to cover their costs, and when he finally became unable to shoulder all the rent, Jonathan became homeless.